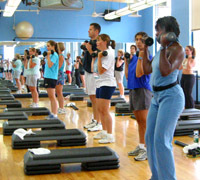 Interested In Personal Training In The Washington, D.C. Area? Consider using the services of Elizabeth Brooks. With over 8 years of experience in training clients one-on-one, Elizabeth will design an exercise program to address your specific health and fitness goals. Check out some of these client testimonials. I have been training with Elizabeth Brooks for over a year. When Elizabeth asked me what my goals were, I told her that I wanted to keep my independence as I am in my fifties.